Hello Everyone, I just had to share the stories I have recently heard from my customers of Rosie Rat the natural cat toy. They are loving it. A little information about Rosie Rat. Rosie Rat has been sold to cat lovers since 1968. It has an international following from Japan to Canada and everywhere in between. Rosie Rat has been seen at cat shows, around the US and is made in the United States by local craft people. The parts are all natural products. On to the stories, one customer bought 3 for her 2 kittens. They immediately took Rosie Rat and hid it and later came back to play. The customer was woken up in the middle of the night with the kittens placing Rosie Rat on her head to be played with these were Ragdolls and Russian Blue cats. She tried to get a picture of the 2 kittens however they moved too quick. Other customers have come back for more as the cats hide them under furniture and in their beds. The cats find these all natural toys instinctively fun. People have tested out which color their cats like best. The toys come in brown, white and mixes. Her cats loved only the white Rosie Rat. Why not sure . Do you have any ideas as to why cats prefer a different color? FunLovingpets.com has been donating a few to the Merrimack Valley Chamber of Commerce raffles. The members love them. These toys keep your cat from being bored and even older cats will play with Rosie Rat. 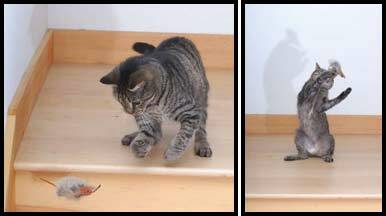 If you can get a picture of your cat or kitten playing with Rosie Rat let us know. The American Veterinary Medical Association (AVMA Veterinary Medical association.